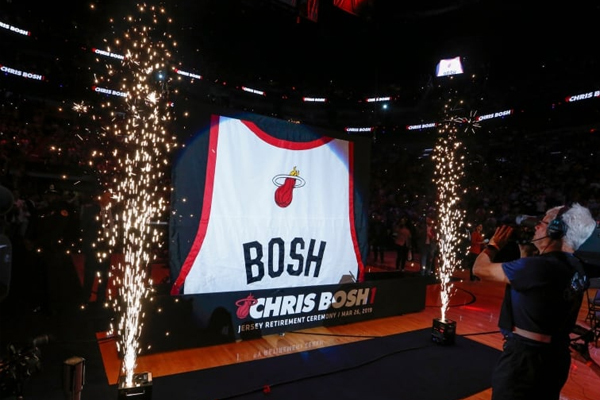 On Tuesday night at the American Airlines Arena, Chris Bosch became the fourth player in Miami Heat history to have his jersey retired by the organization. The Heat recognized Bosh’s significance in a ceremony that included a touching video tribute, fireworks and, of course, one last primal scream. With several former teammates, the current Heat team, members of the front office, and his wife and children in attendance, Chris Bosh gave a captivating speech after his No. 1 rose to the rafters. The ceremony took place at halftime against the Orlando Magic. He was greeted with highlights of his six seasons in Miami, which included six All-Star appearances and two NBA titles. He was also honored by Pat Riley. Then the jersey went up and Bosh gave a short speech to the crowd. But it wouldn’t have been complete without one last scream. Bosh is the fourth Heat player to have his number retired and fifth overall, joining Alonzo Mourning, Shaquille O’Neal, Tim Hardaway and Michael Jordan. He joined the Heat in free agency during the 2010 offseason, leaving the Toronto Raptors after seven seasons. With Chris Bosh, the Heat would go on to win 15 playoff series and two NBA championships in 2012 and 2013.